From the unfamiliar faces of nurses to the fear of shots, it’s no wonder why so many youngsters kick and scream their way through the doctor’s office. That’s why, three years ago, a group of MedExpress employees and a stuffed teddy bear began visiting daycares, schools, and libraries to educate young children about healthy habits, what it’s like to visit a heathcare professional when they’re sick or hurt, and to serve as a healthy reminder that there is nothing to fear. Now, with over 200 MedExpress locations in 17 states, this community initiative – aptly named the MedExpress “Teddy Bear Clinic” program after the furry stuffed bear, Sniffle, who tags along to each lesson – has since turned into a national education program that’s reached approximately 40,000 pre-school and kindergarten-aged children in just three years. MedExpress began offering teddy bear clinics as a way to support the long-term health and well-being of patients and families. The free outreach program provides hands-on opportunities for children to interact with common medical equipment such as stethoscopes and otoscopes, practice basic healthy habits such as hand-washing and sneezing into their elbows, and learn first-hand what doctors, nurses and radiologists do. Children who attend MedExpress Teddy Bear Clinics are even invited to bring their own stuffed friends with them. 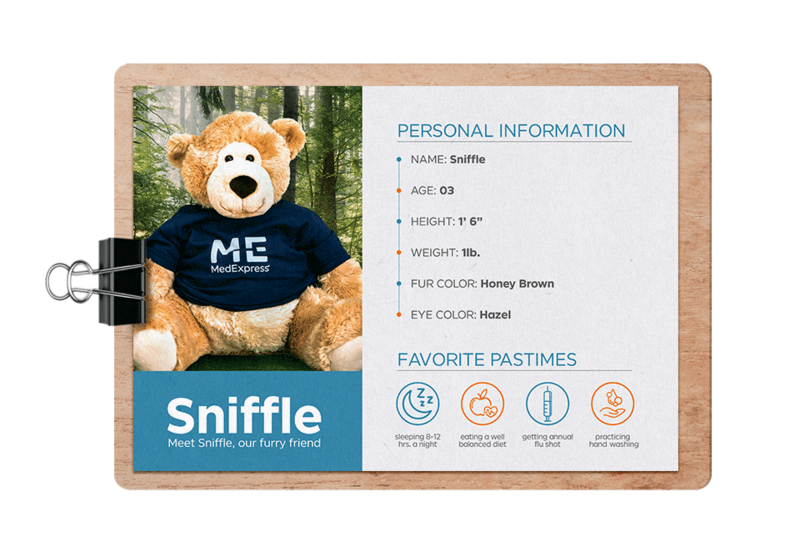 And, with the help of Sniffle, our team’s stuffed teddy bear, children can actually become doctors or nurses themselves by taking teddy’s temperature and blood pressure, using a tongue depressor, and performing mock X-rays. Since the program’s inception, hundreds of MedExpress employees have completed over 1,000 teddy bear clinics at local children’s organizations across the country – and the program continues to grow. MedExpress is a proud partner of schools and community organizations across the country. If interested in scheduling a MedExpress Teddy Bear Clinic, visit our Outreach Programs page. Teaching children about good health.